Meg's favorite Peak Peach recipe is a breakfast treat from Bob's Red Mill. 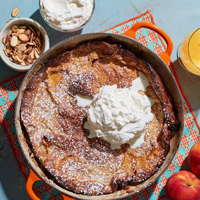 Ripe peaches kissed with the zing of fresh lemon zest are the star of this Gluten Free Peach Dutch Baby. Garnish it with toasted sliced almonds, a sprinkle of powdered sugar and a dollop of whipped cream for a memorable breakfast or brunch. Or heck, make it for dessert (or dinner, if you dare)! Preheat the oven to 425°F. Combine the eggs, brown sugar, whole milk, vanilla and lemon zest in a small mixing bowl and whisk until smooth. In a separate medium sized mixing bowl, combine the Gluten Free 1-to-1 Baking Flour and salt. Pour the milk mixture into the dry and whisk just until combined and smooth. Pour the batter over the peaches and immediately transfer the pan to the preheated oven. Bake until a deep golden brown and slightly rumpled looking, about 20-25 minutes. Remove the pancake from the oven and garnish with toasted almonds and powdered sugar. Add a good squeeze of fresh lemon juice. Slice the pancake into wedges and serve warm with whipped cream.